This can happen for a variety of reasons, such as…. A long focal length (FL) is required to achieve the desired composition. A macro lens is being used for a tiny subject. A low light situation dictates that a wider, open aperture be used to achieve correct exposure. Focus Stacking allows the photographer to take multiple images, each with their own unique focus point or distance and seamlessly blend them into one "fully focused" or "near fully focused" image as required. Naturally this technique is limited to static subjects, as large amounts of movement will not blend across multiple frames, but thankfully our landscape subjects are quite often static and this allows the use of this rather cool technique. 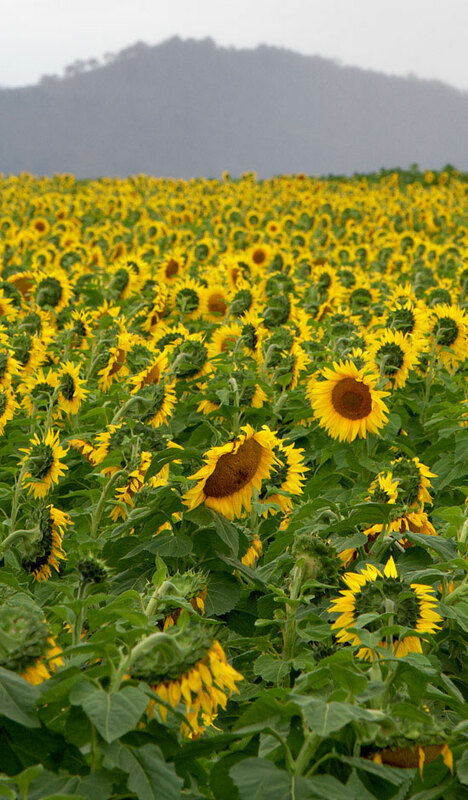 Recently I was out in the sunflower fields near Killarney in Queensland. 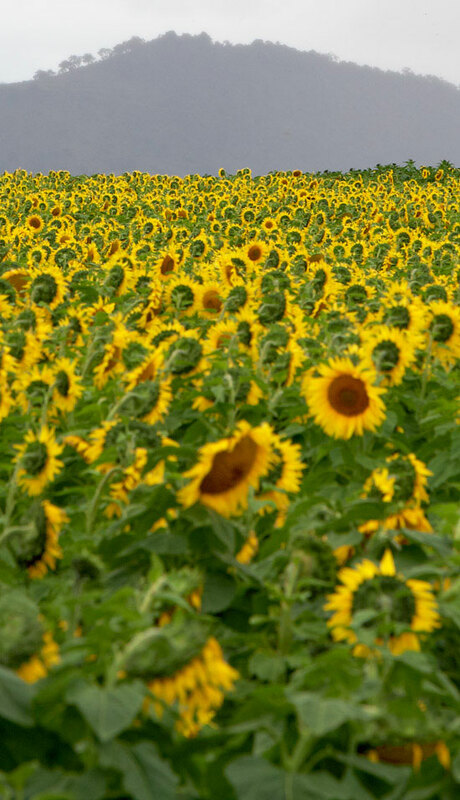 Sunflower fields can be quite difficult to photograph at times, as good vantage points from public access areas are elusive. Shooting wide angles will quite often bring in unwanted foreground objects, while shooting long lenses will limit the DOF. 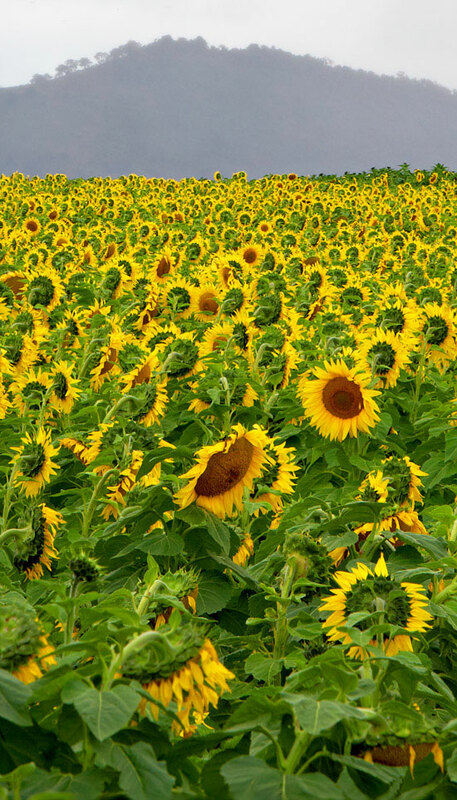 Gaining permission to enter the fields is an option, but sunflowers grow to around 1.8m tall and this makes getting a view difficult without ladders or a naturally elevated terrain. After much zooming around the countryside looking for a decent vantage point, I came across an area where I could just sneak a look over the field from public ground. This view still required that I reverse my Landcruiser onto a dirt mound and that I shoot from a standing position on the rear tail gate. Unfortunately the wide view was not acceptable, as I could not get my vehicle close enough to allow the flowers to fill the foreground area of my frame, so shooting a longer lens and focal length was my only option. This longer focal length meant that my DOF was now limited and to maximise it by using a very small lens aperture could introduce unwanted softness due to diffraction. Wanting to avoid this diffraction and maintain maximum image quality by shooting at my lens' sweet spot of f11, led me to shoot multiple focus distances and then stack. The following two image crops display the limited DOF and how neither pulled enough of the image into sharpness for it to be acceptable….. I understand that some may like the limited DOF, but I was after a lot more than displayed in these images. In the end I shot a total of six images, each at their own unique focus distance. While doing this, I was extremely careful to maintain a consistent view by using a tripod and standing very still on the vehicle tailgate. These six images where then stacked and blended within a focus stacking program, to produce one combined image with greater DOF…. View this image in the gallery. The following is a crop from the above image that clearly displays the increased DOF…. Focus stacking of simple subjects can be conducted manually in image editing programs such as Photoshop, but this image was far to complex with all those flowers, so the dedicated stacking program "Helicon Focus" was used. I am quite sure that there are other focus stacking applications available, so I will leave you to Google for one that is right for you. Like it has done for me, I hope that focus stacking will open a whole new world of images for some of our AustralianLight followers. Focus stacking can make it incredibly easy to produce images that would simply not be possible with traditional methods of DOF control. In my opinion, focus stacking is another must have technique for the landscape photographer's toolbox.